Ive been following Simons progress around Wales with interest as I was itching to get on the water with him a few days & hoping I could get the time off work when he arrived in Pembrokeshire. Simons seems to be busting some new moves since I saw him last! I joined him at Fishguard & he told me to keep the land to the left, this brought us to Strumble Head. Not very lively today at all! Looking at St Davids Head in the distance. That can wait till after lunch! We leave on the turn of the tide heading into very calm sea's. We ignore the bays & head straight for St Davids Head staying well offshore to catch the current. Nearly there. we approach the sleeping dragon on glassy sea's. Passing Carn Llidi as we enter the notorious Ramsey Sound. Errrr, did I say notorious??? An Idyllic view of the Bishops. We pass the sound without any probs! in fact I think I was weeing in my bottle as I drifted over the well dodgy Horse Rock! We settle for Porth Clais. A snippet of camp life. I'm cooking al fresco as I opt to bivi for the night. I take a look at the 9 mile crossing for the following day. As Simon gets his camp sorted. Day Two & we're off. This'll be Simons biggest crossing to date. A headwind was picking up as we Approached Martins Haven. Thats Skomer on the right. Arriving at Martins Haven for a well earned rest! And catching up on Facebook. Though we still find time to play. Before pulling in for another break at West Dale as the tide doesn't turn in our favour till 17:00 for the crossing to Lynney Head & St Govens. Thats Skokholm in the distance. The coastline on this stretch of coast is awesome & very dramatic. We take a short break & Simon thinks we're auditioning for Gladiators??? And his paddle has become a pugil stick! We battle on into the fading light & its almost full dark by the time we reach Broad Haven South. Its raining too & late so we forget socialising, say our goodnights & descend into our tents. Day 3. Morning arrives to reveal a canvas of pure beauty & more than one set of bare arse cheeks as the morning skinney dippers arrive! We decide on an easy day after the milages of the two previous days. We choose to head for Tenby ready for the crossing to the Worms Head on Gower. We stop at Stackpole for food & coffee in the cafe there as well as climb a hill for some phone reception. We stopped at beautiful Shrinkle Haven, not too far from Tenby. Passing St Margrets Island in the mist. Simon wants to book into a B&B??? I choose to camp & it turns out to be a beautiful evening. To be fair Simon did need to recharge his phone batteries but he picked the best night to do it on??? 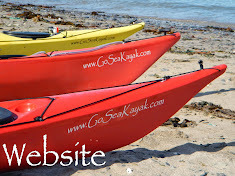 The following day Sean & Paul join us for the day, we choose to paddle to Pendine sands for the night. Sean & Paul posing infront of St Catherines Island. Some good leaning by Sean. Checking out the gap at St Catherines Island. Too shallow today. Passing the new Tenby Lifeboat station. We pull into Pendine for a rest & to say our goodbyes to Sean & Paul before looking for a camp spot. As you may well have figured the rest involved more coffee! Back on the water we chose to camp just a quarter of a mile up the beach but its easier to paddle there than carry so thats what we did. It was a lovely spot & I got a campfire going in the evening just in time for my bosses arrival as I'll be taking Mikes van back to Fishguard in the morning while he paddles with Simon for a couple of days.